This story has it all for me. 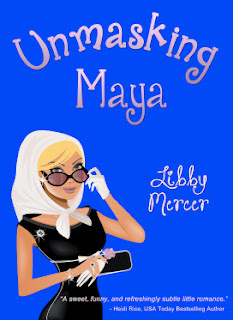 Unmasking Maya introduced me to Maya, a confident and talented main character and Derek, a hot, mysterious love interest and a secret. If the author, Libby Mercer, had written the book with just a tad bit more detail and and the book was longer, it would have easily hit the 5 star mark. I liked Maya right away. She seems like someone I would admire in real life. She’s an artist with a background in fashion design, which the author describes in really great details. I couldn’t see the artwork, but I could envision the colors and fabrics thanks to the descriptive writing. I kept thinking as I was writing, that I felt bad for Maya. She was alone in a new city, doesn’t have a lot of friends around and is working for a guy that seems like a jerk. But even though he is a jerk, you love to hate and hate to love Derek, the big CEO loner she is commissioned to do artwork for. And then before I knew what was happening, I was secretly rooting for Derek to sweep Maya off her feet. And he did, but not in that romantic comedy way where they chase the girl through the city on a bike they stole from a guy on the street. Derek made Maya fall in love with him in a slow, self assured pace, in his own sweet time, which fits his character perfectly. However, during the book where Derek and Maya are obviously falling for each other, I found myself asking for more information. I felt like they needed just a couple more “soul bearing” conversations, especially from Derek’s point of view. They needed a little bit more passion and if I’m being really honest, more kissing! But maybe that’s just me and my need for romance in my books. Intermixed with Maya and Derek’s story are details of Maya’s mysterious past and why she ended up in San Francisco and not in New York City as a fashion designer. I loved how the mystery unfolds, with little bits of information here and there and surprise characters who show up unexpectedly. I remember, right at the end of the book, when I realized that I was actually SMILING as I read. And that, my friends, is a sign of a good read. Thank you to Libby Mercer for our review copy!